Swatching is always a good excuse for interrupting a wear-time experiment... heh. Oh well. I was bored and these were more interesting than waiting for my polish to chip! Misa's fall 2010 collection is quite a relief for me. It seems their last three collections (all cremes!) had lost that creative Misa personality that we all love. While these shades aren't super unique, they're at least interesting and remind me of all those old gorgeous Misa shades that made me fall in love with the brand (like Chocolate Icing, Blueberry Glaze, Toxic Seduction, you know the ones!). It's You! How are you gentlemen! Haha, sorry couldn't resist. But seriously, this polish is actually called "It's You!" I can see this being the nail polish equivalent of "Who's On First?". This shade looked like a smoky green with copper duochrome in the promo picture, but it's not. It's a deep grey base- not quite black- more soft charcoal, with green pearl shimmer and subtle pink duochrome. The first picture shows the green, the second picture shows the pink from a different angle. You may need to click to enlarge. It's like a less-frosty, less-duochrome cousin of Borghese Stellare Notte. Maybe like Jessica Casablanca and Stellare Notte had a baby? Like It Like That. 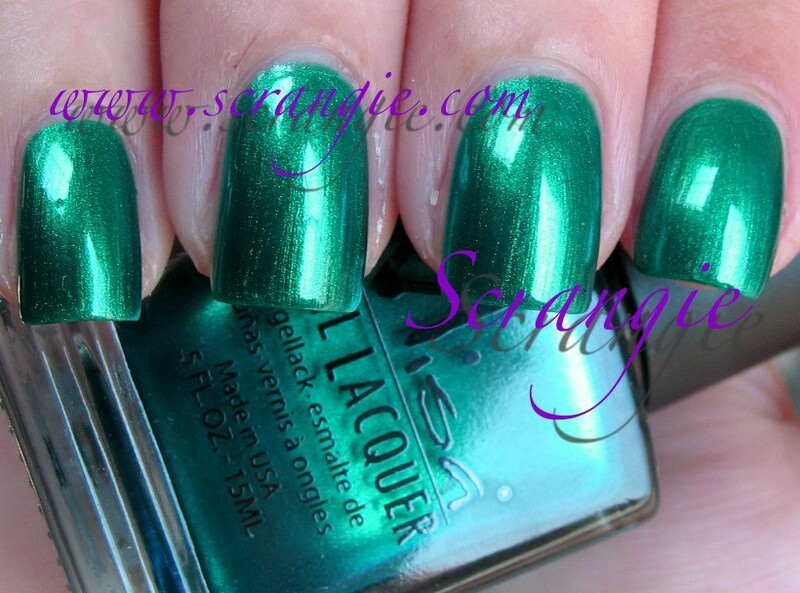 A bright metallic green with blue duochrome. My pictures make it look more blue toned, but it's much more yellow toned golden green- like bright grass- and blue around the edges in real life. It's sort of a cross between Bloom Bianca and Sally Hansen Lagoon but much more green. It has the depth of Bianca but the smooth metallic finish of Lagoon with the blue/green duochrome effect of both, but a lot more green than blue. Very pretty. You may need to see this in real life to get the full effect. Perfect Kiss. Standard medium magenta shimmer. Lots of light reflecting shimmer particles give a lot of depth to this color. Other than that, not particularly noteworthy. Quirky Smile. Very pretty teal shimmer. I'm growing very fond of teal lately. This is a little deeper in real life, but I wanted to get a good picture of the shimmer in direct sunlight so it got washed out a little. Sort of reminds me of peacock feathers. Spinning Out Of Control. Blue-purple shimmer. This looks more purple in the bottle, but when applied I find that it's more blue than purple. It's like blue with purple shimmer. Blurple... is this considered 'blurple'? Man, what a weird word. I think my picture still makes it look more blue than it really is, but it's totally not as purple-y as I thought it would be. Makes me think of Borghese Plumaggio Purple, that one seems more blue than purple on the nail than in the bottle too. When You Say My Name. Last but definitely not least. A deep, rich shimmery brown. My favorite kind of brown. Look at it. It's so beautiful. It seems red-based, but neutral. Is that possible? It's not super warm like a lot of browns. Maybe this is even a cool brown. I don't know. I'm not so good at the warm/cool thing but it doesn't seem strongly cool or warm on me. It's just really pretty and really sparkly. Excellent fall color. Love it. The formula was good on these. A little thin but easy to control without too much of a tendency to pool. Opacity was really good too, all of these are two coats except It's You! which is three and I feel it really needed the third coat. Standard Misa brush- a little on the long side, thin, round. Slightly long dry time. I really like Misa bottles... there's something about them. They're so square and strong and uniform but still elegant. They line up so nicely in drawers and on racks... They look really special. Random, I know, but I was reminded of that when I was swatching these. Haven't swatched Misa in quite some time. Which reminds me that I still need to post the Mardi Gras summer collection, but I need to finish the pictures. They were really finicky to capture! I'll get to those soon. Overall, I like this Misa collection. I had been pretty disappointed with the last couple of collections due to the lack of variety and unoriginality of the colors, but this collection has renewed my faith in Misa to make nice colors! I was really hoping they could re-capture the amazingness of the Poisoned Passion collection from fall 2008, which in my eyes was practically a perfect collection. While this isn't quite as perfect (in my eyes, at least!) as Poisoned Passion was, it does come close and this is definitely a nice selection of shades- I love every color but Perfect Kiss. I just wish Misa would bring back all of their amazing duochromes (or maybe do some new ones)! That's what got me started on Misa in the first place and I think they excelled at them. Wow, did I make a mistake! Like It Like That looks the best, it's Perfect Kiss that doesn't scream 'Buy Me' in my opinion. i loooove the brown! it's weird that i don't even have ONE misa in all 400+ of my polishes huh. I don't have any Misa's yet either, but I really like It's You! I do NOT like brown polish. But - this is a BIG but - I am drooling over When You Say My Name. That color is gorgeous!! I also like Quirky Smile. Great collection. Quirky Smile and Spinning Out Of Control are the only two I kinda like and I'm using "kinda" very loosely. But not bad at all. I think I want all of these! I, too, love the bottle. I like the sound the cap makes when it "clinks" onto the glass. I also look forward to your China Glaze Christmas ones, too! I really like this whole collection, way to go Misa! My favourite thing about Misa is their bottles, I just love the way they look. Spinning Out of Control is my uber fave here. Nice collection. Nothing outstanding but pretty never the less. Lovely swatches as always, Scrangie! When does this collection release? I'm getting all except Perfect Kiss. Really nice collection. I would loooove it if they made more duo-chromes! I know what you mean about their bottles. I like how the cap/brush feels so substantial in your hand. I thought I didn't like browns...and then I saw your swatch of Misa Chocolate Icing and ordered it thinking it was more red than brown. It's not, but it's gorgeous and I'm going for WYSMN too (as well as Quirky). You should get commission Scrangie, you really should.